Trying to fix the issues in college hoops uncovered by the federal investigation into corruption won’t be an easy task, but the first steps in that process were taken this spring. 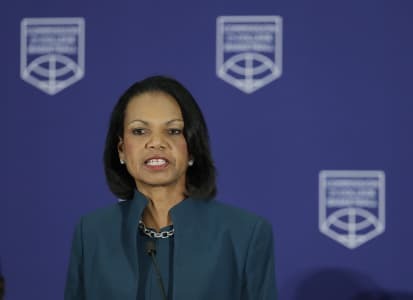 On Wednesday, the commission on college basketball, headed by former Secretary of State Condoleezza Rice, presented recommendations for reform. They addressed one-and-done, agents, shoe companies and penalties for rule breakers among other topics, but failed to bring anything new to pending decisions on the transfer process and college players making money off their name and likeness. From coaches and athletes to college hoops observers and fans there was talk all over social media Wednesday morning about whether or not these recommendations would do anything to solve the corruption problem – and when changes would actually be made. Nobody knows yet. Harsher penalties for cheaters – The FBI probe resulted in several assistant coaches and one legendary coach losing their jobs amid alleged violations, but what happened to other schools, coaches and players implicated? The Commission didn’t address how those people included in the federal investigation will be punished if found guilty of cheating, but they recommended stricter penalties for rule breakers moving forward, including five-year postseason bans and increased financial penalties for programs with repeat violators, potential life-time bans for major rules violators already under show-case penalty (coaches basically on probation for certain period of time) and “significantly” increased head coach restrictions for breaking rules. You can bet the sport will look different in the future. But how much different? We’ll see in the next several months before the 2018-19 season.